Roger Berry sculpts fluid, circular ribbons and knots out of Cor-Ten steel and silicon bronze. Seemingly, this art has no beginning and no end; they are just multi-dimensional works of magic. 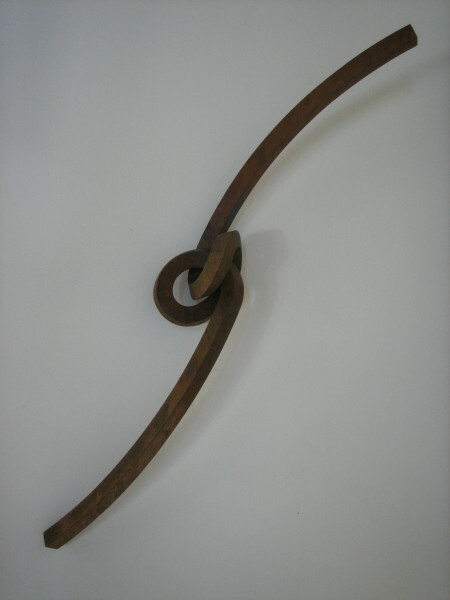 The precision of the work is based on specific geometry and damn fine welding. 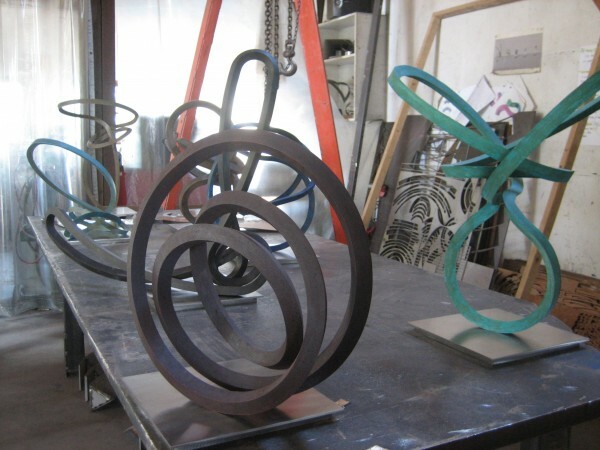 While he is best known for installations of large, heavy sculptural works, Berry is currently showing smaller pieces at the Stremmel Gallery in Reno, NV through October 25th. A selection of Roger Berry’s art prior to being transferred to the Stremmel Gallery, Reno, NV, 2014. Berry’s sculptures are permanently displayed at numerous locations throughout California including The Crocker Art Museum (Steel Eclipse) and the UC Davis Education Building (Emergence) in Sacramento, the Berkeley Repertory Theater (Brutus), and at the Oliver Ranch (Darwin) in Geyersville, CA. 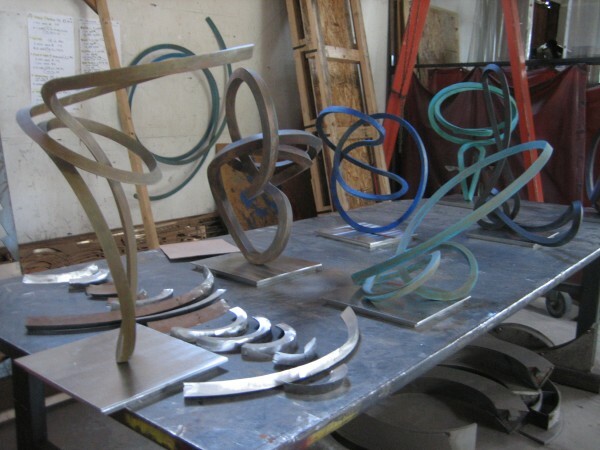 This prominent northern California artist’s work has been commissioned for public sites in cities across the country and Europe, as well as for corporations and private residences. 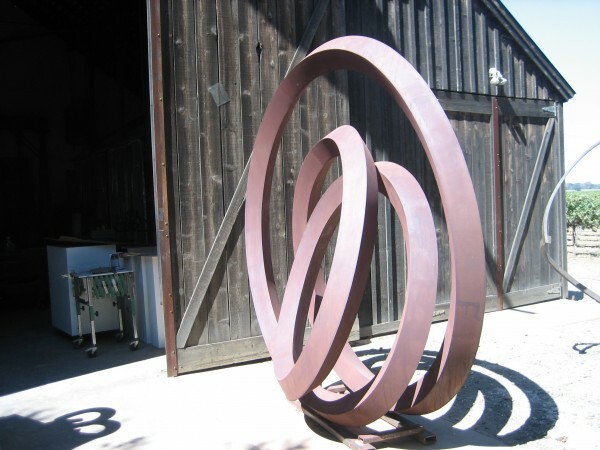 Berry, a graduate of the University of the Pacific’s Raymond College and a Sacramento native, builds his monumental sculptures in a rustic studio in a refurbished barn just a stone’s throw from the Sacramento River Delta in Clarksburg, CA. Surrounded by 17 acres of wine grapes, Berry’s idyllic setting is enhanced by uninterrupted views of farmland and spectacular sunsets. 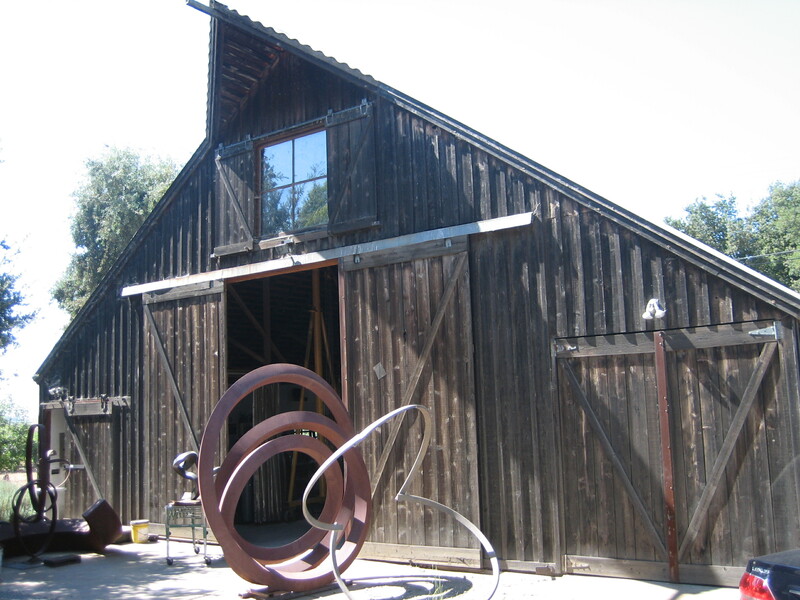 Exterior view, Roger Berry’s studio. It is here on a warm early Fall morning that Berry talked about his artwork and his life. The following are highlights of that discussion. LS: Can you explain your process? RB: I just work. It’s literally that simple. I might have an idea of what it is I want. I might get this extraordinary idea of a little scribble but the nature of this geometry is completely unforgiving. It’s actual conic sections. I’ve got to work within the restraints of the geometry in every piece. If I’m trying to come back so that I make a complete loop, I’m constrained by what the geometries would be. LS: How do you use the computer for your work? RB: I only work in AutoCAD and I work completely in 3-D. It’s a fairly clumsy program. However there are programs now where you can throw your arms in the air and make a fantastic thing that’s not buildable. But with AutoCAD I’m actually building as I go. It’s as though I’m making those parts. I’ve been doing the same kind of process my entire life. I’ve been putting things together. It’s like making cabinets. The difference is that I’m working in steel now. I can build anything if I can imagine it or see it developing. That’s the important thing. I’m watching them develop. It’s sort of my computer game. When I’m in a building mode, I’m at that screen all the time. Roger Berry, silicon bronze sculpture, 2014. LS: So how does the work transform from a computer model to an actual piece? RB: I start out in AutoCAD with a solid triangle. Next I indicate cut sections and I rotate them, maybe into a 120-degree arc. That’s how I build parts. But when I’m starting, it’s actually just a flat triangle. I revolve them, take them apart and make them into three pieces. Then I flatten them. Then they (The “they” Berry refers to here, are two assistants whom he employs for their excellent welding skills.) tack them together and weld them. All of this work has an enormous amount of welding time because every corner has to be fully welded. Fortunately for me, they’re really good. Virtually all of this is silicon bronze and they’re doing it all (welding) with Tig. We used to do everything with Mig. I’m a heavy plate welder. That’s what I did. This new work is finesse welding. They are violin players. 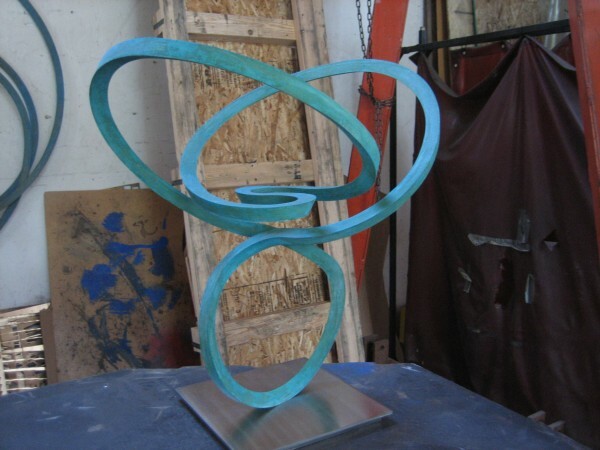 Roger Berry, Silicon Bronze sculpture, ready to be sent to Stremmel Gallery, Reno, NV, 2014. LS: Do you have a subject in mind when you create art? RB: I’m really just interested in seeing what will happen. It’s all pretty much an experiment. A question gets answered and then I ask it again. The form suggests the form and then I see what can happen. LS: How important is texture, weight, color? RB: Oh, it’s critical. Stainless steel is a terrific material. I’ve done a lot of work in stainless steel. It’s the best public art material there is because it’s infinitely retrievable. It’s also a terrible sculpture material because it has to be finished to be light, to be bright, to be jewelry, and that takes away its weight, it’s visual weight. You can make a lot of amazing structures with them but you have to understand that you’re dealing with buoyancy. If I work in bronze, which at a fairly large scale you have to have a patron, then I can darken it. This is so lovely, this feels right, it’s friendly. There is something subtle about bronze. And when you’re working with it, it yields so much more quickly. 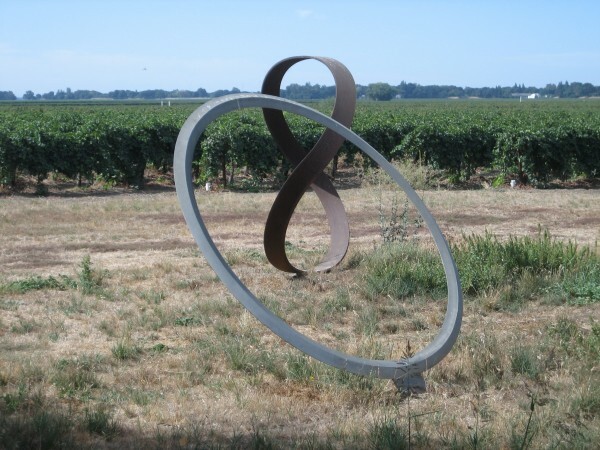 Roger Berry, stainless steel sculpture, geometry of the sun. I love Cor-Ten steel. 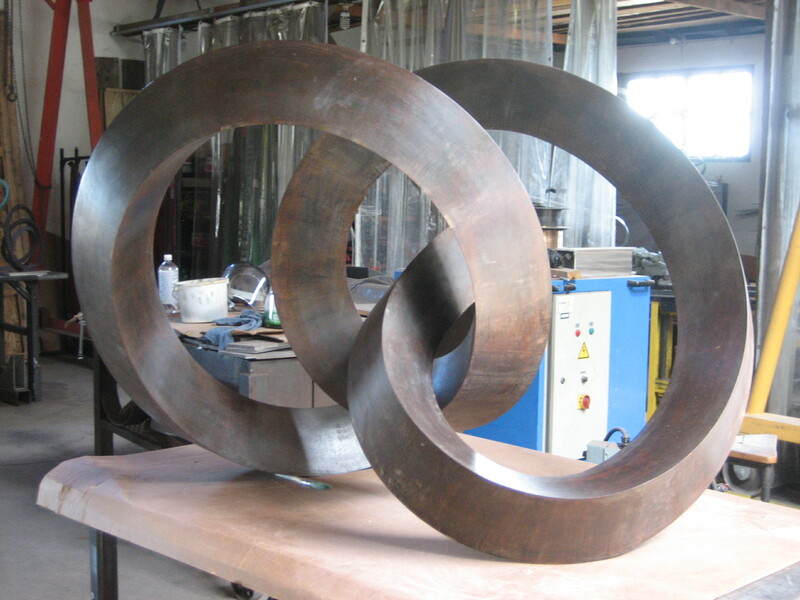 I make big sculptures out of Cor-Ten then anything else. Cor-Ten will always have a coarse feel to it. So there are times when I would really like to work with corten for its density but the situation doesn’t allow it. When I’m building larger public work, I will only go to Cor-Ten if it’s going to be seen away from you because it’s not a social material. LS: Do you think about what the material will look like in several years? RB: Yes. With Cor-Ten and stainless steel I know almost exactly what’s going to happen. With bronze, not so much so. Because bronze always wants to revert. So any pieces that go outside, I put a lacquer on them, which is something I don’t love to do, but it does preserve them. If they go outside and nobody pays any attention to them for a long time, they’re going to all be green. It’s just what it will be. 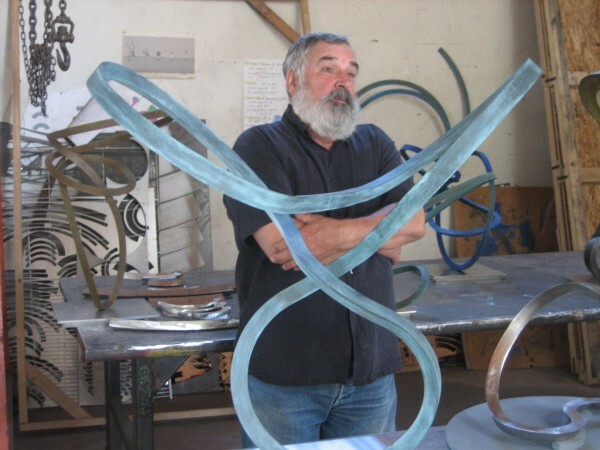 Roger Berry, sculpture rests in front of his studio, 2014. There is an extension to that question. Overtime, especially outdoor work, it kind of gets roots. Put something into a new landscape and the sculpture always looks a bit foreign. Over time — I know this sounds like baloney — it’s as though it develops roots. It and the landscape begin to jive. I think about that a lot. LS: What do you hope the viewer of your art takes away? RB: I’m mostly interested in people feeling the forms, seeing them, being engaged by the fact that they change as you go around them. But there is always some kind of precariousness in my pieces and I hope that people appreciate that. LS: Do your sculptures tell a story? RB: Not a literal story, no. They are dynamic so as you walk around them, they change and that’s really their story, along with their weight and their color. LS: Were you exposed to art when you were growing up? Were there art or art books in your home? RB: My mom liked art a lot. She wasn’t really knowledgeable but we had ‘50s art books. We always went to museums when we went places. I went to the de Young and saw the very first Van Gough show there. But that wasn’t my interest. I’ve built things my entire life and that’s really what led me to be a sculptor. 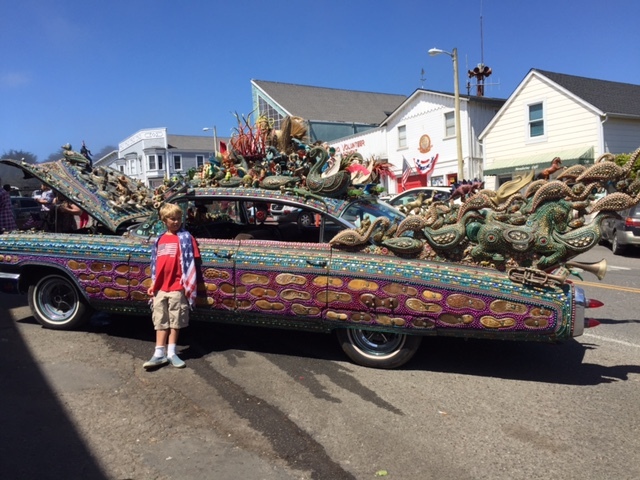 My first sculpture was a soapbox racer. I built soapbox racers for ten years, five of which were legitimate and I could actually race. Where does it begin? Where does it end? Roger Berry sculpture. LS: How did you do? RB: Fat boys never win. But I had good cars. And I was one of the few people who actually built his own, which I didn’t realize until much later. But I absolutely loved it, which is why I’m interested in Indy cars. I see them as an extension: crazy open aerodynamic things. I spent years trying to figure out aerodynamics. LS: Have you been influenced by any particular artists? RB: I get a kick out of Brancusi and Degas. Brancusi: I just love the work. I’ve seen as much of it as I can. The thing about Brancusi is that I love the form. Early on I was trying to carve that way and make those kinds of forms. When somebody does that so well, there’s no point in following it. As I paid more attention to him, as I got older, I realized that his way of working suited me. He never finished anything. He always built it again. There are maybe 20 pieces that he did over and over and over. Because his work was not really about invention, it was about seeing. Invention is way overrated. We don’t create, we work. When I realized that, I realized I’m free now. Degas: Those ballerinas are really significant studies in balance. Degas’ inquiry was very much like the motion studies done by Eadweard Muybridge. People think that Rodin was the most important sculptor of his time. Degas was. And I do believe that. 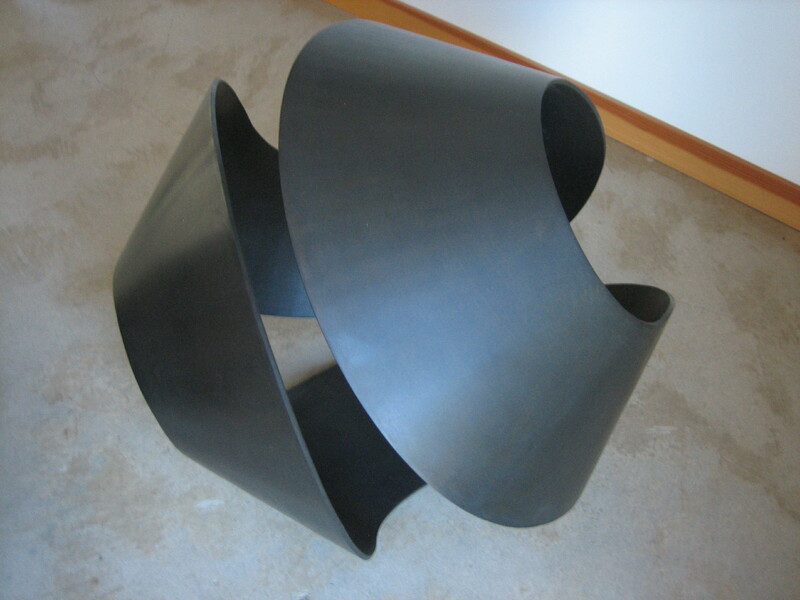 LS: Your work also reminds me of Richard Serra. RB: How could I not be aware of Richard Serra’s work? At times I’ve been much closer to it. 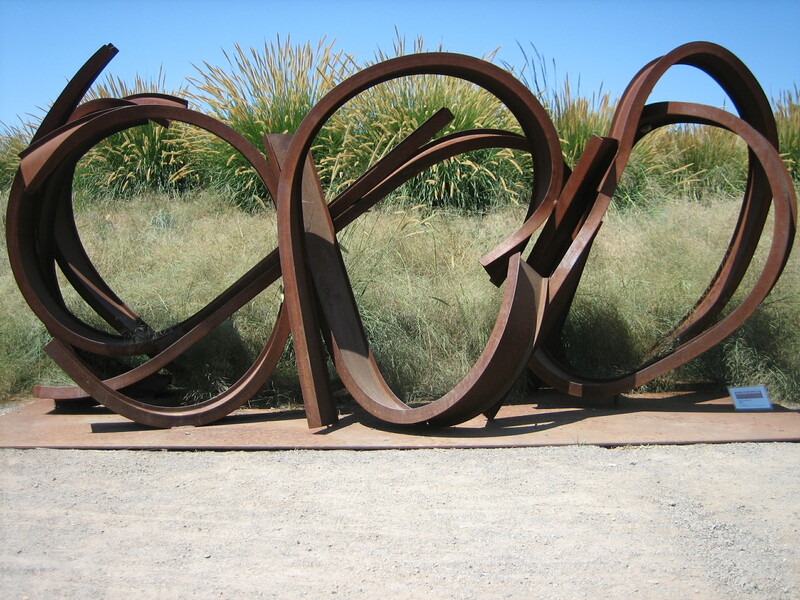 The biggest piece that I did, which is at the Oliver Ranch, he liked. And, I’ve made a point of trying to see anything I can of his work. I’m not making that kind of work now; I think I was when I started. LS: Your work appears abstract. Have you ever dabbled in realism? RB: Yes, there’s a weather vane on top of the garage that’s a fish. It’s one of seven that I built for a school in Terre Linda. I also built a cow and a calf in a corral out of Cor-Ten. There are Cor-Ten deer of mine in Folsom, in a park at Natomas Station. The very first sculpture I ever made was a portrait of a woman named Lee. All of these were commissioned pieces. I did some fairly realistic things when I was starting out because that’s what you’re supposed to do. And I realized that I didn’t like them very much. LS: Is your wife Carol an artist? Does she have any influence on your work? RB: Oh she has infinite influence on my work and we’ve been married 41 years. Carol knew me when I was a student but she is not an artist. I think that’s probably smart. I do know artist couples, but I think it would be difficult. 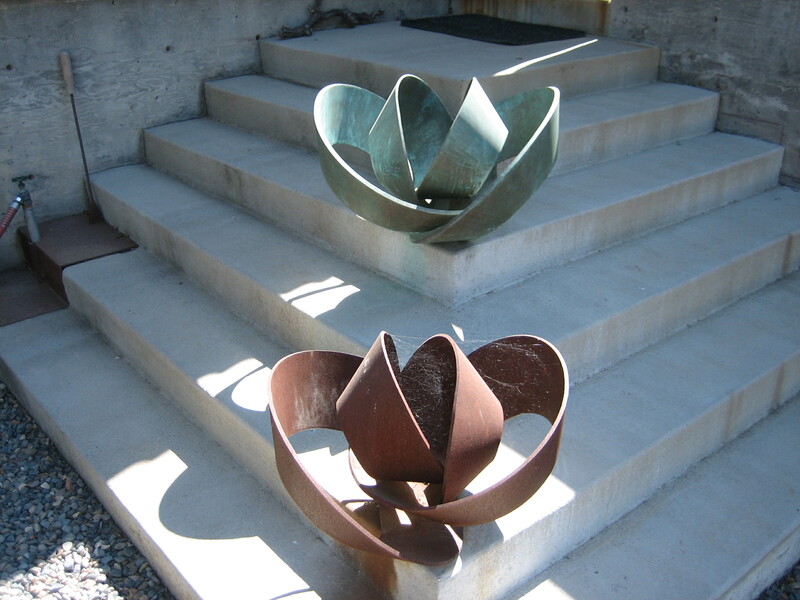 Sculpture greets visitors as they ascend the stairs to the home of Roger Berry and his wife Carol. LS: Do you collect art by others? RB: We do collect. We’re not major collectors because we haven’t the means. But we have a Richard Serra print. We tend to collect works on paper, mostly prints because they’re accessible. You can collect all over the world and yet you don’t have a collection, you have an assembly. We wanted some coherence to it. But we don’t have enough money to make it serious. LS: What do you do in your down time? RB: There isn’t any. I work. I work on the vines and I work in the studio. The only thing close to down time is when we go away. But mostly I work. And, I like it that way. It’s what I enjoy.